OK, today I am picking up where I left off. 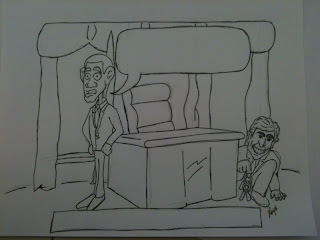 I have my drawing inked, fairly clean and I want to start on my lettering for the dialog and banner. The first thing I want to do is establish my letter height and placement. One way to do this with paper is to rough it in lightly with pencil to get an idea of what you want. I did this and then went back and put in guide lines for height and level for my letters. 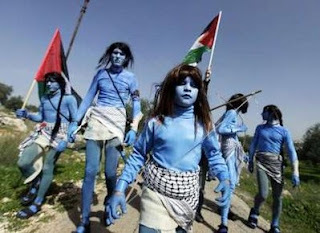 These guys have something to say? Really? For this drawing I used lined paper under this and lightly traced the lines. You can also use a ruler and t-square or 90 degree angle to set up the height and level. Once I have it roughly where I want it, I pencil in the lettering and then ink it using the same technique I use on the lines. This allows me to clean up my guide lines before I scan it. At this point I am ready to scan my image. Usually I scan it in as a PDF (just because that is what I have access to when I work during my lunchtime) and then grab the image into Paint Shop Pro. Once I have it in, I soften the focus and then sharpen it to eliminate some of the sharper edges from the scanning. This helps with removing some of the pixeling which is part of the process. Once that is done, I select the background color of the drawing and use the paintbrush option to clean up the unwanted marks. No one likes dirty pictures. Am I right? Hello... ? Once I have it cleaned the way I want it I then add my base colors by using the magic wand option and then the paintbrush to color the sections. Once I am finished with the base colors, I then go back and add some shading and highlights. Tom Richmond has a great tutorial section on his blog about how to do this. Since I am just learning, I'll leave it to him. (Besides, most of my stuff is nowhere near as complex as his yet, so mine is just highlights and minor stuff). When I am done I usually just make a PNG file for uploading to the web and keep my basic PSP file for Paint Shop. I hope you enjoyed my rambling. 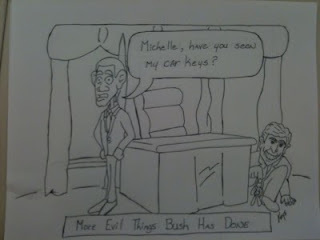 Look for more of the "Evil Bush" series soon. 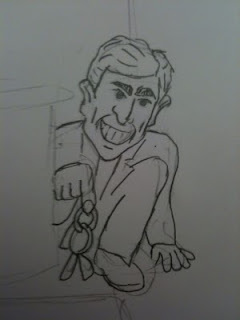 Van asked for me to post a few pictures of what goes on behind the scenes as I do a drawing. I love the idea, and I had an idea for a series of illustrations so I thought I would take the first in the series and use it for an example. This will be pretty long, so I may break this up into two or three posts. We'll see how it goes. First off, we have the idea. THE WIFE and I have been wanting me to do some more illustrations and try to break into cartooning and freelance illustrating. The 9 to 5 grind of the job is wearing down on all of us, so I have been trying to brainstorm on how to approach it. 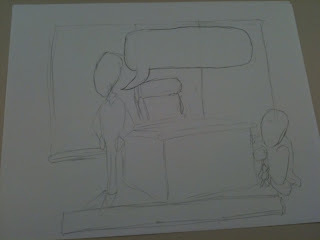 Basically I think my "Thing" is single panel design of random goofiness. 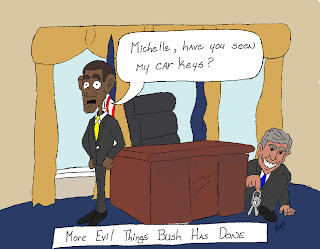 For the current series, I decided to pick on President Obama and his tendancy to blame Bush for things that go wrong. 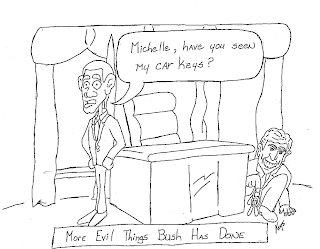 I thought I could show some more "Evil" things Bush could be doing. Basically just have some fun with things and try to share a laugh at everyone's expense. So with that idea, the first thing I do is sketch out how I want the picture to lay out. I usually do my stuff on plain 8 and 1/2 by 11 printer paper as it is cheap and easy to find. 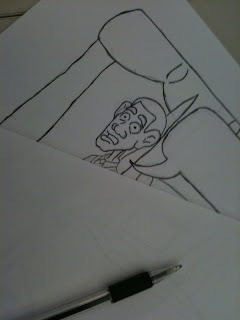 Once I get done, I scan it into my PC and do the coloring unless I am doing colored pencil or something similar. I decided to go with just a plain side view layout with a desk in center, chair, some windows in the background and two figures. I think one of my weaknesses is that I tend to be unimaginative with my viewing angles and this is an example of it. 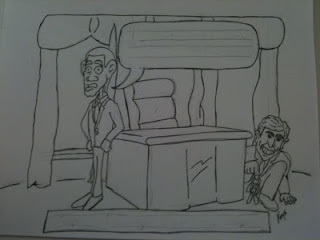 The one on the left will eventually become President Obama and the one on the right behind the desk will Become "W". Once I get done with the rouch layout I start adding some detail into the items on the paper. 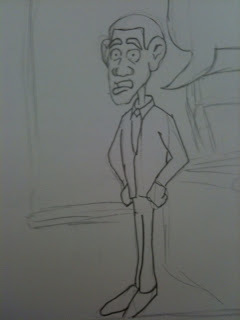 Here I start on some detail work for "The Prez." Now I throw some detail work on our evil little buddy. 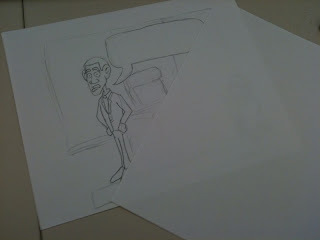 One trick I learned to help keep my pencil sketches clean came from my old high school drafting class. Just take a second sheet of paper and rest your hand on it. This will keep your drawing hand from smudging, smearing or softening the pencil lines you already have down. Anther benefit is if you use any kind of ball point pen to do inking, the graphite from the pencil can prevent the ball from rolling and keeping the ink from spreading properly. Once I get the main objects in and along the lines I like (or can tolerate) , I'll start throwing in some background detail to keep it interesting. Honestly... A day in my head is beyond description. 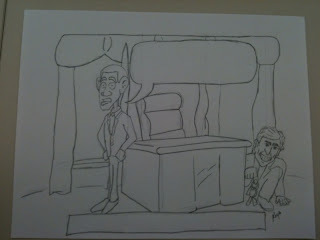 While I was doing this, I dug up a few pics of the Oval Office and checked out the curtains behind the President's desk. So I added them in along with the flags. Yes, actually they DO match the drapes. Next comes inking. I like to go over my pencil lines with ink to darken them in more for scanning. This also allows me to use an eraser much easier to clean up my lines and get a better image. At this point, my ink pens are pretty boring, just standard black ball point pens. WHAT ARE YOU DOING WITH THAT PEN??? So here we are with the inked and (somewhat) cleaned up image. I have my dialog ballon ready and banner at the bottom. I timed this and at this point I have about an hour's worth of time in (Yea for my lunch break!). This is probably a good place to stop for today. Tomorrow or Thursday, I'll pick up with lettering, scanning, and cleanup / coloring on the PC. 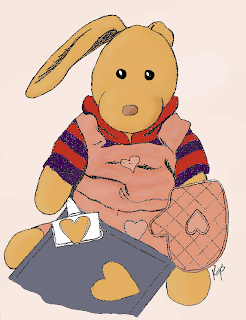 I did a couple of drawings for my buddy Zachary Rabbit over at http://somebunnyscreation.blogspot.com/. I hope he likes them and I wanted to put them up here for everyone else to see also. Hopefully somebody will rescue me from the Telecom Dungeon and hire me as an illustrator! 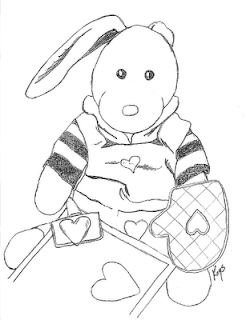 Here's a pencil sketch for kids to color! Hey I can dream about escaping from Telecom can't I? In addition to getting a foot of snow last week in Dallas, I am trying to adjust to other things, obviously Ben is too. The teacher I was thrilled for him to get has a problem with her work Visa and cannot continue working for the school. My frustration boils over because I am called "Racist" or "Heartless" for wanting everyone to follow our immigration laws, but seeing someone who is working and following the rules fail drives me insane. Knowing that there are millions of people here who just walked across the border and either stole an identity or are living off the grid while this woman gets harassed by Homeland Security is nothing but CRAP! We need immigration reform in this country and I openly admit that, but with that said, we HAVE to secure our borders. We can't just keep giving amnesty to illegal immigrants every 30 years or so and calling it "Reform." We also have to streamline the process to get immigrants INTO the country because there are a lot of people who want the American dream. 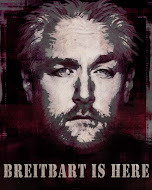 I have hopes for Ben, I know God is watching out for him and his situation is better than is ever was before even with all the turmoil of the last couple of weeks. I still have my faith. I just hurt to see my son having more frequent meltdowns and fighting more frequently with everyone. I have also noticed he isn't sleeping in his bed anymore, he has pulled his bedding off and is sleeping in the floor of his closet. I don't understand, but all I can do is try to help and trust in God. 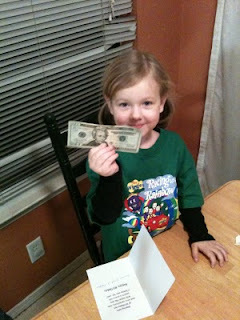 My youngest daughter Sadie turns 4 today. Please drop her a comment and wish her a happy birthday! I wrote about Ben's troubles at his old school. We moved him after THE WIFE spent the last of his third grade year homeschooling him. His fourth grade year was much better as we changed school and got him into a class with a teacher who loves him and worked with us to help him succeed. This year has been rougher because he had to move to fifth grade and had a new teacher. She was great with him and worked hard to understand him and try different things. Unfortunately her class is basically a bunch of hoods. For some reason parents are blinded into never seeing when their kids misbehave and think their little "Prince" or "Princess" can do no wrong. That is the situation there. Throw on the fact this is the teacher's first year and you have a recipe for disaster. Because of all the problems with the other kids in the class we were frantic because we started seeing behavior problems which were not related to his Asperger's. Backtalking people, refusing to do work or co-operate in addition to real problems and shutting down. We were mortified and all of us (home and school) were trying to find a solution. Now there has been a shake up at the school and Ben's teacher was moved from fifth grade to first grade. That meant Ben was getting a new teacher. We were terrified. How would Ben handle it? What would she be like? I need to learn to relax and trust that God has his hand in this. Ben's old teacher is LOVING teaching first grade and now realizes what a great job she has. Ben's new teacher is a wonderful woman who is full of love and IMMEDIATELY spotted what was going on. She talked with a friend of THE WIFE and mentioned she has noticed all of the kids in the class are picking on Ben. This alleviated our fears that Ben had just "Turned Bad." She even immediately picked up on a situation where Ben was being blamed for instigating problems with another kid, when she picked up on the other kid instigating. Thank you God. Thank you for watching over my boy. My buddy Van was confused by my reference to 6:30PM being my time to celebrate. He took it as a TV reference rather than I get off at 6 and it takes me 30 minutes to get home. Turns out Van suffers from a little know disorder known as "TV Guide challengednessitude." He even has a handicapped tag for it! He gets special parking at "The Wal-Marts" with it!